The Republic of Djibouti, May 08 /CSRwire/ - The 2015 East Africa Environmental Risk & Opportunities (“ERO”) Summit, held May 2-4, brought together ministers, private sector leaders and development experts from 4 continents and more than 16 countries to discuss regional environmental threats, as well as specific opportunities to address climate change, waste transformation, marine ecosystems and environment-linked health challenges, all under the umbrella of ‘resilience and adaptation to environmental change.’ The event and associated environmental initiatives were seen to be an important regional step towards the December United Nations Climate Conference, COP21, which aims to produce a binding and universal climate agreement among world nations. The ERO Summit was hosted by the President of the Republic of Djibouti, H.E. Ismael Omar Guelleh, and organized by Perim Associates, LLC; Djibouti’s Minister of Higher Education, Dr. Nabil Mohamed; the Center for the Study and Research of Djibouti (CERD), the University of Djibouti and the Djibouti Chamber of Commerce. Participants and sponsors included the Intergovernmental Authority for Development (IGAD), the United Nations Economic Commission for Africa (UNECA), Yale University, U.C.S.F., the Saudi Fund for Development, the French Institut de recherche pour le développement (IRD), the Horn of Africa Regional Environmental Centre and Network (HoA-REC), the Overseas Private Investment Corporation (OPIC), The Homan Group, The World Bank, G4S, Starwood Hotels & Resorts, Coca Cola, Turkish Airlines, Coubeche Ets., EyePACS, Curtis-Mallet, Prevost & Mosle LLP, Emiroil, Horizon Terminals, Dubai Ports World, the InvestIn Group, U.C. Berkeley, Enventix, Fox Rothschild LLP, Smart Data Science LLC, JET Recycling and many others. Coinciding with a visit to Djibouti by U.S. Secretary of State John Kerry, the first by a U.S. Secretary of State to the country, the event underscored the connection between the environment, economic development and regional security. Secretary Kerry congratulated Djibouti on hosting the summit, and its nascent partnerships with U.S. universities, in remarks delivered May 6. Among the initiatives proposed at the summit: a regional Climate & Environmental Observatory under the auspices of the 8-nation Horn of Africa Inter-Governmental Authority for Development (IGAD); a Yale University-led East Africa & Arabia Climate Impact Assessment Task-force (EAACIAT), which is to produce the first high-resolution climate impact model of the region, and a Regional ‘Acute Care & Screening Corridor’, backed by the Institute for Global Emergency Care (IGEC), a partnership between U.C.S.F. Global Health and the African Federation for Emergency Medicine. The latter would integrate a network of ‘hub-and-spoke’ emergency-care clinics with pandemic monitoring capacity, to help countries in the region respond and isolate infectious diseases like Ebola, whose spread is also linked to environmental change. The network’s physical infrastructure will be outfitted with environmental monitoring capabilities, and feed into the regional monitoring center. The summit highlighted Djibouti's bid to use its developing logistics infrastructure, environmental research cadres and increasingly critical position at the crossroads between Asia, the Middle East, and Africa to become a demonstration hub for environmental technology, renewable energy, rural and acute health care, and clean-tech. Djibouti’s active engagement with Western universities like Yale, the University of California, the University of Massachusetts and the University of New Hampshire, and specialized environmental, agricultural and waste-transformation companies, is a case in point. Dr. Jalludin Mohamed, Director of the Center for the Study and Research of Djibouti (CERD), said: "CERD and Djibouti look forward to collaborating with this focused group of prestigious U.S. universities - and expanding existing collaboration with long-time African and international development and research partners to fortify the local and regional response to critical environmental challenges." Ambassador Jean-Marc Chataigner, Director General, Institut de recherche pour le développement (IRD), said: "The future of our children must be our priority. We have a duty to preserve the planet they will inherit. 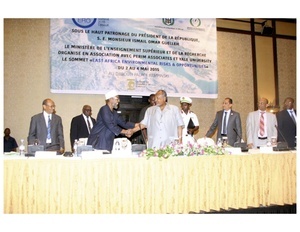 The conference of Djibouti was a decisive step toward the success of Paris Climate 2015." Dr. Andrea Tenner, U.C.S.F. Department of Emergency Medicine, Global Health Division, and The Institute for Global Emergency Care (IGEC) said, “In accepting the challenge of planning rural, acute care delivery, Djibouti is taking a leading role in making healthcare more accessible to East Africans. This week's summit made very clear the critical link between access to health and overall healthcare system resilience and stability." For more information on the ERO summit, initiatives and associated publications, follow the website at www.eastafricaecosummit.com, or contact info@perimassociates.com.